"*Who We ARe - Wildlife Conservationist .com is the premier online directory and resource guide for global wildlife conservation. " 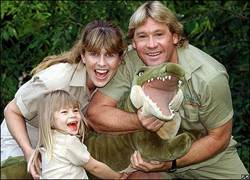 An initial postmortem examination has confirmed that Australian environmentalist, zoo owner, and television personality Steve Irwin, the "Crocodile Hunter," was killed by a stingray's venomous barb pierced his heart. Police investigating the incident told a packed press conference this morning that his death was the result of a highly unusual accident. "We're not going into the detail, but there's definitely no surprises," a police spokesperson said. "Everyone knows how he died." A coroner will begin an examination today and will consider video footage of the attack, which happened at about 11:00 a.m. local time on Monday as Irwin swam over Batt Reef, off the Australian state of Queensland . The stingray attack was caught on film during the production a new television special Irwin was making with his eight-year-old daughter, Bindi Sue. The documentary was to have been screened in the United States next year. The footage shows Irwin pulling the stingray's barb out of his chest before losing consciousness, Stainton says. and it's terrible," Stainton said.